ACCOUTERMENTS IV Kentucky Rifles and Pistols, Tomahawks, Axes, Knives, Powder Horns, Hunting Bags, Trade Silver, Indian Historic and Pre-Historic Artifacts. by James R. Johnston. Hardbound, 8-1/2� x 11�, 247 pages. 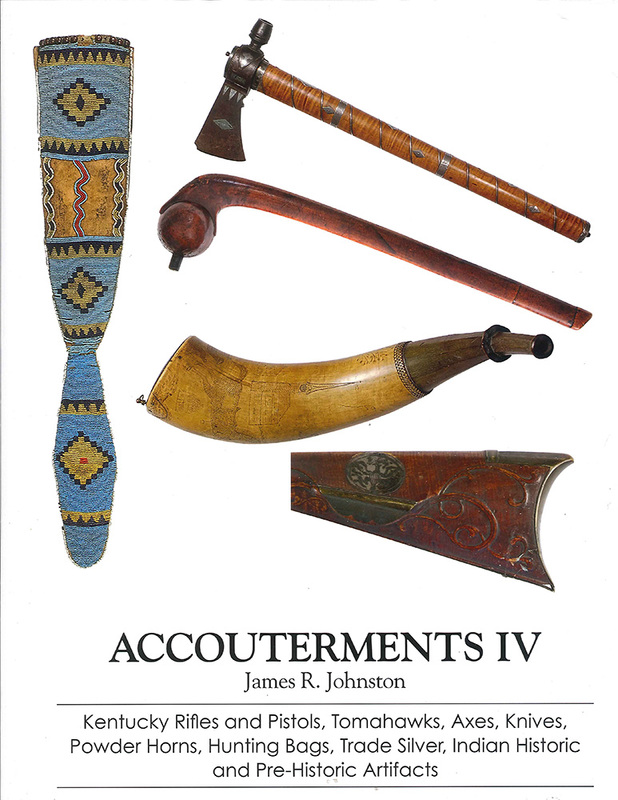 The newest volume in the Accouterments series this volume features many rifles, pistols, powder horns and artifacts that have not previously been published. Many of these items have been in private collections for years and off limits to the public. This work is divided into categories, Rifles, Fowlers, Muskets, Pistols, Powder Horns, Hunting Bags, War Clubs, Tomahawks, Axes and Halberds, Trade Silver and Pre-Historic and Historic Indian Relics, for easy reference. Each item is photographed in detailed, closeup, full-color photography many items with more than one angle. Items are then explained and include key measurements. A great work for historians and artists alike.